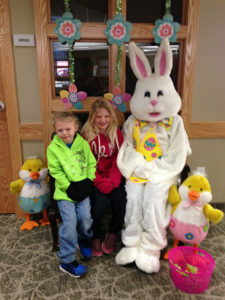 The Easter Bunny visited with kids last Saturday at the Cedar Springs Community Library. Visitors to the Cedar Springs Community Library received a special treat on Saturday, March 24, when the Easter Bunny dropped in for a visit! Over 300 people attended the Easter event, which included choosing a craft to make and getting their photo made with the bunny. The Easter Bunny gave the kids a bag with a pencil, and chocolate wrapped to look like a carrot. When they ran out, he handed out coloring pages of eggs, the Easter Bunny and Chicks. One of the biggest surprises of all was that the Easter Bunny knew the names of many of the children. He is one smart bunny!